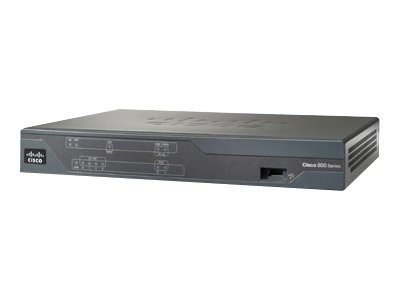 The Cisco 880 Series is ideal for small branch offices and teleworkers who need to be connected to larger enterprise networks as well as small businesses for either voice or data applications. These routers help extend corporate networks to secure remote sites while giving users access to the same applications found in a corporate office. When users require WLAN access, visibility and control of network security are even more critical at the remote site. The Cisco 880 Series meets this need with a single device that combines integrated 802.11g/n capabilities with security features such as Wi-Fi Protected Access (WPA), including authentication with IEEE 802.1x with Cisco Extensible Authentication Protocol (LEAP) and Protected EAP (PEAP) and encryption with WPA Temporal Key Integrity Protocol (TKIP). (Refer to the wireless solution overview and security data sheet for more information.) The Cisco 880 Series models that include the integrated access point can use either autonomous or Cisco Unified WLAN modes. In Cisco Unified WLAN mode, as part of an enterprise WLAN architecture, all WLAN functions are centrally managed through Cisco Wireless LAN Controllers and the Cisco Wireless Control System (WCS). Service providers and value-added resellers can take advantage of the Cisco 880 Series to provide a true business-class broadband service. Business customers are using broadband access to connect to the Internet or to connect offices together, and they require a platform that incorporates voice and security without sacrificing performance. The Cisco 881V and Cisco 887VA-V voice routers offer industry-leading voice gateway capability with the ability enable Cisco Unified Communications Manager Express or SRST as required. Many of these customers are connecting computers in offices through WLANs; having a single device for both WAN and WLAN access provides a new option for managed services. These customers also require a higher level of support to keep their networks operational. Services with these customers should be simple to set up, while allowing a level of remote management and troubleshooting to address support inquiries quickly. The Cisco 880 Series meets the requirements of small offices and managed services providers.